BIGGEST LIST of gift card deals, gift card promotions and gift card BOGO offers of the 2018 Holiday season. Best “Buy One Get One” deals of the season. Check out the Gift Card Deals that last beyond the holidays. Unlike regular gift cards, promotional gift cards often have expiration dates and other terms and conditions. Read the fine print carefully. Read more tips on promotional gift cards. With the 2018 Holiday Season officially underway, stores will be making it easier (and less expensive) to buy what is already the most-requested gift of the holiday season–gift cards. The best gift card deals are typically announced early in the month, might only last a day or two and are likely to end by mid-December. That makes sense, right? Stores know you will either procrastinate doing your holiday shopping and end up buying gift cards at the last minute anyway, or you will turn to the trusty plastic after spending the early part of the month trying to find the perfect traditional present. Either way, the closer we get to Christmas and other December holidays, the easier it will be for stores to steer you towards their gift cards without offering gift card BOGO’s (“Buy One, Get One” or “Give One, Get One”), holidays gift card promotions and other gift card bonuses. Be on the lookout early to find the best sales on gift cards! Below is a list of holiday gift card deals found in stores and online during the 2018 holiday season. NOTE: MUST BUY FROM MERCHANT: The information below is provided to help you find the best deals on gift cards. Click on the merchant links to learn more about the offer terms and conditions and to buy the gift cards mentioned. Applebee’s Buy a $50 Applebee’s gift card and get a $10 Bonus Applebee’s card. Bonus gift card offer valid until 1/6/18 at participating Applebee’s locations only. Bonus card may not be redeemed on the day it is issued and it EXPIRES 3/3/19. Aeropostale Buy $50 Aeropostale gift card and get a free $25 cash card. This promotional card is valid for $10 off purchases of $50 or more between December 26, 2018 and January 31, 2019. BJ’s Restaurants Give a $50 BJ’s Restaurant gift card and get a $10 bonus gift card and 20% off VIP card. Give $100 BJ’s Restaurant gift card and get $25 bonus card plus a 20% off VIP card. BOGO offer valid through January 1, 2019. Bonus gift cards valid January 1 thru February 13, 2019. Baker’s Square Now thru 12/31/18. Buy a $25 gift card and get a $5 bonus card. $5 Bonus Gift Card is redeemable at any participating Bakers Square Restaurant, but is not valid on whole pies, pie slices to-go or gift cards. Must be used 1/1/19 to 2/8/19. Black Angus Get $10 Holiday Bonus Bucks for every $50 in gift cards purchased. Bonus Bucks redeemable on a future visit during 1/1/19 through 2/7/19. Present Bonus Bucks at time of ordering to receive $10 off. Bonefish Grill BUY $50. GET $10 FREE: Purchase $50 in Bonefish Grill Gift Cards between November 1 through December 31 and get a FREE $10 Bonus Card. Bonus Card is a promotional card, valid for redemption January 1 – February 10, 2019. Valid at any Bloomin’ Brands restaurant location in the United States. Bristol Devon Guest Holiday Gift Card Bonus Offer. For every $100 Bristol-Devon gift card purchased, receive a $20 dining certificate to be used 1/1/2019-2/28/2019 (except 2/14/2019). Brooks Brothers Buy a single Brooks Brothers Gift Card in the amount of $150 or greater from 12/3/18 to 12/24/18 and receive a $25 Bonus Card that can be applied toward a merchandise purchase from 12/26/18 to 1/31/19 in U.S. and Canadian Brooks Brothers Retail and Factory stores; may not be redeemed online, by phone or in Airport Stores. Buca de Beppo Buy a $50 Gift Card before December 31, 2019. Receive $10 reward card. 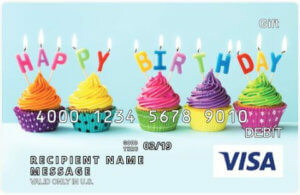 Reward card will be sent electronically to purchaser email. Gift Card Purchases must be made between 11/1/2018 – 12/31/2018 • Reward card valid between 1/1/2019 – 2/28/2019 • Offer available in store and online. 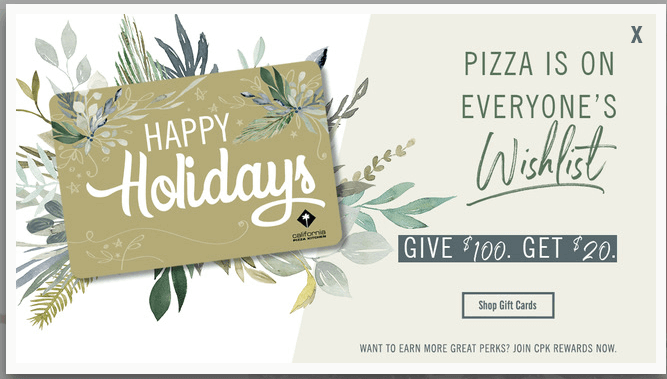 California Pizza Kitchen Purchase $100 in gift cards before January 1, 2019 and receive a $20 promotional gift card good valid from 1/7/19 through 2/24/19. The Capital Grille Purchase $500+ in gift cards and receive an exclusive The Capital Grille knife set plus an additional gift card worth 10% of your purchase. Carrabba’s Buy $50 in Carrabba’s gift cards between November 1 and December 31 and get a FREE $10 off promotional coupon. Bonus coupon valid at next visit from 1/1/19 to 2/10/19. Cheesecake Factory Gift a Gift Card, Get a Slice! Now thru 12/31, receive a complimentary slice of Cheesecake with EVERY $25 gift card purchased on website or in restaurant. Check website and stores for details. *Slice of Joy card redeemable on a future visit from 1/1/2019 – 3/31/2019 for one complimentary slice of cheesecake or layer cake. One card per guest. Must be present to redeem. Valid in the United States and Puerto Rico only. Children’s Place Now thru December 25, 2018 – Get a $10 Bonus Card with a $50+ gift card purchase. Get a $15 Bonus Card with a $75+ gift card purchase. Get a $20 Bonus Card with a $100+ gift card purchase. Customer will receive a Bonus Card for use on a future purchase. Bonus Card values are $10, $15, or $20 and subject to terms & conditions. Bonus card valid December 26 – February 2, 2019 in U.S. and Puerto Rico stores and online (excluding shipping to Canada) only. Chilis Now thru December 31, 2018 – For every $50 in Chili’s Gift Cards purchased, the purchaser will receive one $10 Holiday Bonus Card that is valid from 1/1/19 through 2/6/19. Claim Jumper Now thru December 24, 2018 – Restaurant Gift Card BOGO. Buy a $50 Claim Jumper gift card and receive a $10 Reward Card that is valid January 1 thru May 31, 2019 (excluding Valentine’s & Mother’s Days). 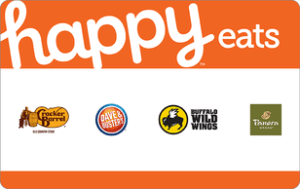 Promotional gift cards valid for redemption at any participating Landry’s Inc. restaurant in the US. Costa Vida For a limited time only. Get a $5 Bonus Card for every multiple of $25 in Costa Vida gift cards purchased. (ie. for a $100 gift card you will receive 4 $5 Bonus Cards!) Bonus cards expire June of 2019 and cannot be redeemed for cash value. Rewards points for the purchase are awarded when the gift card is redeemed. All Gift Card Sales are final. Daily Grill Get a $25 Reward eGift Card for every $100 worth of Daily Grill, Grill on the Alley or Public School on Tap gift cards. Offer valid through January 1, 2019. Reward Card valid January 1, 2019 through February 28, 2019. Dave & Busters Buy a $50 Dave & Busters gift card and get $10 FREE coupon for game play. Additional $10 FREE game play will automatically be added for each subsequent $50 spent. BOGO Coupon must be redeemed 1/7/2019 – 3/31/2019. Del Frisco’s Double Eagle Receive $20 in Bonus Cards with every $100 in Del Frisco’s gift cards purchased. Bonus card promotion is valid for gift card purchases over $100 from November 1, 2018 – January 1, 2019. Bonus Cards valid for use January 1, 2019 to March 31, 2019. Redeemable at any Del Frisco’s Double Eagle Steakhouse, Del Frisco’s Grille, and Sullivan’s Steakhouse. Del Frisco’s Grill For every $100 spent in Del Frisco’s Grill gift cards, get $20 bonus card. Bonus card promotion is valid for gift card purchases over $100 from November 1, 2018 – January 1, 2019. Bonus Cards valid for use January 1, 2019 to March 31, 2019. Bonus Cards redeemable at any Del Frisco’s Double Eagle Steakhouse and Del Frisco’s Grille. Dunkin’ Donuts GIVE THE GIFT OF DUNKIN’ – Buy $25 in Dunkin’ Donuts gift cards and receive a $10 bonus card. Minimum purchase of $25 in total DD Cards during one transaction on www.giftcards.dunkindonuts.com only. Excludes Dunkin’ Gift Card purchases in Dunkin’ restaurants, bulk, and 3rd Party locations. Limit one $10 bonus eGift Card per customer from 11/26/18 – 12/24/18 or while supplies last. The $10 bonus eGift Card must be enrolled on the Dunkin’ Donuts App, Dunkindonuts.com or redeemed at a participating Dunkin’ Donuts locations by 1/31/19 to receive promotional $10 value. DSW FREE $5, $20, OR $30 BONUS CARD when you purchase $50, $100, or $150 in DSW gift cards online & in store through December 26, 2018. Earn Bonus Cards November 1–December 26, 2018. Redeem Bonus Cards January 4–26, 2019. Redeemable in US stores and at dsw.com. Eddie V’s Buy $500 or more in holiday gift cards and receive an elegant martini set along with an additional gift card worth 10% of your purchase. Einstein Bros Bagels For every $25 Einstein Bros Bagels gift card, receive a $5 bonus card. The $5 Bonus card is a promotional card, not a gift card. Valid at participating Einstein Bros.® Bagels locations only. Not valid at some licensed locations which may include restaurants in airports, hospitals and on college campuses. Bonus card is valid between January 1, 2019 through February 28, 2019. Firebirds Wood Fire Grill For every $100 worth of Firebirds Gift Cards purchased, the purchaser receives two $10 Bonus cards. Qualified purchases containing eGift Cards will receive two Digital Gift To You Cards. Bonus cards will be emailed to the purchaser’s email address. Bonus cards valid – 1/1/19 – 2/7/19. Fontainebleau Gift Card BOGO Holiday Offer: Buy a $250 Fontainebleau gift card and receive a $50 Bonus Card. Buy a $500 Fontainebleau gift card and receive a $100 Bonus Card. Buy a $1000 Fontainebleau gift card and receive a $200 Bonus Card. Holiday Bonus valid until August 31, 2019. Valid for purchases throughout Fontainebleau Miami Beach only. For Lapis Spa and Salon services, reservations required. Fleming’s Steakhouse Receive a $20 Bonus Card for every $100 spent on Gift Cards now through December 31, 2018. A treat for them and a treat for you. Bonus card valid 1/1 to 2/10/2019. GLAMGLOW Now thru December 25, 2018 – Get a $25 reward egift card with a $100+ GLAMGLOW egift card purchase. Get a $50 reward egift card with a $150+ GLAMGLOW egift card purchase. Valid on a single transaction of an online egift card purchase of specified amount. Purchaser will receive a $25 or $50 egift card valid towards a future purchase. Reward egift card does not expire. Gilmore Now thru January 1, 2019 – Buy $100 in Gilmore gift cards and get $20 Promo Certificates valid January 1, 2019 – December 31, 2019. $20 Promo Certificates may not be used in combination with any other offer or discount and are not valid in combination with Gregslist Dining Rewards. Gordmans Buy $50-$74.99 in Gordmans e-Cards, get $5 e-Card free. Buy $75-$99.99 in e-Cards, get $10 e-Card free. Buy $100 or more in e-Cards, get $15 e-Card free for each $100. Offer valid for Gordmans e-Gift Cards purchased December 1 – December 25, 2018. Grill on the Alley For every $100 worth of Daily Grill or Grill On the Alley or Public School on Tap Gift Cards, the purchaser receives a $25 promotional card via email. Offer eligible from November 06, 2018 to January 01, 2019. Reward card valid from January 1, 2019 through February 28, 2019. Grimaldi’s Pizza Grimaldi’s Holiday Bonus Offer. For a limited time, Give a $50 Grimaldi’s gift card, get a $10 bonus card. 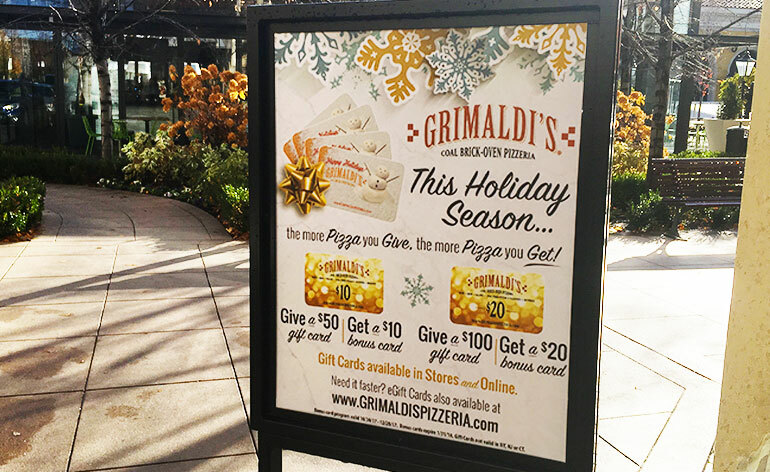 Give a $100 Grimaldi’s gift card and get a $25 bonus card. Offer valid October 29, 2018 – December 30, 2018. Bonus cards expire January 31, 2019. 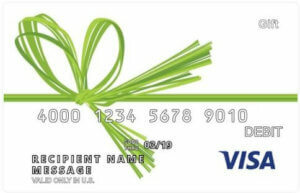 Gift cards and bonus cards not valid in NY, NJ or CT. Guitar Center For every $100 in Guitar Center eGift cards you purchase from GuitarCenter.com between 12/6/18 and 12/16/18, get a $20 Guitar Center promo egift card, valid from 12/26/18 through 1/31/19. Half Price Books Get a $5 redeemable coupon when you buy a $25 Half Price Books egift card online. Offer valid on gift cards purchased in store and online November 1 – December 24, 2018. Free $5 Card is redeemable January 1 – 31, 2019 in store and online. See card for details. Harry & David Receive a $20 Bonus Card with every $100 Harry & David eGift Card purchased between 11/29/18 -12/31/18. Bonus Cards valid 11/29/18 – 5/31/19. Hooked on Harry’s Get a FREE $30 Gift Card for every purchase of $100 in Hooked on Harry’s gift cards now through December 24, 2018. Hof’s Hut Give One, Get One! For every $50 worth of Hof’s Hut eGift Cards purchased, the purchaser receives a $10 Bonus Card. Bonus Card valid 01/01/2019 through 03/31/2019. Offer ends December 31, 2018. Houlihan’s Gift Card BOGO: For every $50 Houlihan’s gift card purchased, you will receive a $10 dining certificate to be used 1/1/2019-2/28/2019 (except 2/14/2019). JCPenney Get a $25 off $25 or more coupon, redeemable 11/29-12/25/2018 on orig, reg, sale and clearance-priced apparel, shoes, accessories, fine jewelry and home when you spend $100 or more on e-gift cards. 11/25-11/28/2018. J Gilbert’s Gift card GOGO Offer: For every $100 gift card purchased, the purchaser receives a $20 dining certificate to be used 1/1/2019-2/28/2019 (except 2/14/2019). Kona Grill Gift Card BOGO: For every $50 worth of Kona Grill Gift Cards or eGift Cards, the purchaser receives $20 Kona Grill Promotional eGift Card. From now until December 31, 2018. Bonus eCards are valid starting 1/1/2019 through 3/31/2019. Landry’s For every $50 worth of Landry’s Gift Cards purchased, the purchaser receives a $10 Holiday eReward Card for the following Landry’s Brands: Holiday Tier 1: Aquarium, Babin’s, Brickhouse, Bubba Gump, Cadillac Bar, Claim Jumper, Fish Tales, Fisherman’s Wharf, Flying Dutchman, Joe’s Crab Shack, Landry’s Seafood, Lighthouse Buffet, Lillies, Mai Tai Bar, Rainforest, Red Sushi, Saltgrass, T-Rex, Yak & Yeti (Digital and Plastic). Promotional eReward Card valid 1/1/19 -5/31/2019. Blackout Feb 14 and May 12, 2019. Offer ends December 24th, 2018. Logan’s Roadhouse For every $50 in Gift Cards purchased, receive $10 in Bonus Cards. Bonus cards delivered electronically and valid 11/6/2018 through 2/13/2019. (Bonus cards not redeemable on day issued.) EBonus Card offer ends 12/31/2018. Longhorn Steakhouse Enjoy a $5 Bonus card when you purchase $25 in gift cards. Bonus card redeemable with purchase of 2 adult dinner entrees from 1/1/19 to 2/3/19. Valid for online gift card purchases only. Lucille’s Smokehouse BAR-B-Q Give One, Get One! For every $50 worth of Lucille’s Smokehouse eGift Cards purchased, the purchaser receives a $10 Bonus Card. Bonus Card valid 01/01/2019 through 03/31/2019. Offer ends December 31, 2018. Marcus Hotels Buy $100 in Marcus Hotels gift cards and get a $25 Bonus Card. All bonus cards expire on March 31, 2019, no exceptions. Speaking of Hotels…Check out this list of Hotel Birthday Bonuses and Credit Card Perks for year-round deals. Marcus Theaters Get $15 FREE in Snack Cash vouchers with every $50 Marcus Theaters gift card purchase! Vouchers can be used towards any food or beverage item at your local Marcus Theatre. Snack Cash vouchers are valid January 15, 2019 through March 31, 2019. Megaplex Theaters The Bounce Back is instantly added to eligible eGift Card purchases of $25 or more. For every $25 in qualified eGift Card purchases the purchaser receives one $5 Concessions Bounce Back Promo eGift Card that can be redeemed for any concessions item(s) Jan 3, 2019-March 31, 2019. Morton’s From November 1 until December 24, 2018, buy a $250 Morton’s gift card and receive a $50 Reward Card. Reward cards valid January 1 thru May 31, 2019 (excluding Valentine’s & Mother’s Days). Reward cards valid for redemption at only Morton’s Steakhouse or Morton’s Grille US locations. Ninety-Nine Give $25 in Gift Cards, Receive TWO $5 Bonus Cards. For every $25 Gift Card you purchase, receive TWO $5 Bonus Cards. Offer available online only until Tuesday, 11/27/18. Noah’s New York Bagels For every $25 Noah’s New York Bagels gift card purchased, receive a $5 bonus card. Bonus card is valid between January 1, 2019 through February 28, 2019. Bonus card expires on February 28, 2019. Noodles & Company Get a $5 Bonus Card for every $25 in crave cards purchased from November 1st – December 31st. Offer available in-restaurant or online. For gift card purchases over $100, gift cards must be purchased online. Gift card promo valid 11/7/18-12/31/18. Bonus cards valid from 11/7/18-1/15/19 for in-restaurant purchases only. The Oceanaire Now thru 12/24/2018 – Promotional Holiday Gift Card Offer. Buy a $100 The Oceanaire gift card and receive a $20 Reward Card that is valid January 1 thru May 31, 2019 (excluding Valentine’s & Mother’s Days). Outback Steakhouse Get a $10 Bonus card with every $50 Outback Steakhouse gift card purchased. Bonus card valid for redemption January 1 – February 10, 2019. Valid at any Bloomin’ Brands restaurant location in the United States. Gratuity, taxes and alcoholic beverages not included. P.F. Chang’s For every $100 in P.F. Chang’s eGift Cards purchased on 11/26/2018, purchasers will receive via e-mail one (1) $20 Bonus Reward certificate. This $20 Bonus Reward card is valid for the purchase of food or non-alcoholic beverages only for up to $20 USD value and may be redeemed between 1/01/2019 – 2/28/2019 only at participating P.F. Chang’s restaurants located in the contiguous United States (excluding Hawaii and airport locations). Panda Express IN STORES ONLY: Receive free fortune cookies with a $25 gift card purchase. Offer ends December 31, 2018. Panera Bread Get a $10.00 bonus card for every $50 in Panera Bread® plastic gift cards and eGift cards purchased or reloaded in-cafe or online between 11/14/18–12/31/18. While supplies last. 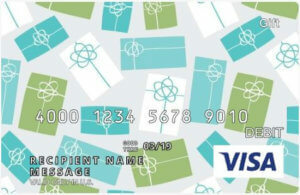 Bonus card can be used multiple times until the $10.00 is depleted or the promotion expires. Bonus cards are valid online or in-cafe at participating bakery-cafes from 1/1/19–1/22/19. Pappas Bros Steakhouse Receive a $10 E-Reward Card for every $50 purchased in Pappas Gift Cards. The E-Reward Card is valid on a future visit between January 1st – February 28th, 2019. All E-Reward Cards will be emailed to the Purchaser. Pappadeaux Receive a $10 E-Reward Card for every $50 purchased in Pappas Gift Cards. The E-Reward Card is valid on a future visit between January 1st – February 28th, 2019. All E-Reward Cards will be emailed to the Purchaser. Pappas Seafood Receive a $10 E-Reward Card for every $50 purchased in Pappas Gift Cards. The E-Reward Card is valid on a future visit between January 1st – February 28th, 2019. All E-Reward Cards will be emailed to the Purchaser. Public School on Tap Get a $25 Reward eGift Card for every $100 worth of Daily Grill, Grill on the Alley or Public School on Tap gift cards. Offer valid through January 1, 2019. Reward Card valid January 1, 2019 through February 28, 2019. Red Lobster For for every $50 you spend on Red Lobster gift cards, in-restaurant or online, you will receive a bonus card valid on a future visit in the month of January. Red Robin Free $5 or $10 Bonus Buck Reward when you buy a $25 or $50 Red Robin Holiday Gift Card. Bonus Buck Reward Card valid from 1/1/19 through 2/28/19. Regal Cinemas This Holiday season, for every $50 in gift cards purchased at a participating Regal location you will receive a $10 concessions bonus card. Offer available 10/29/2018 – 12/31/2018 or while supplies last. The $10 concessions bonus card is redeemable for concession purchases beginning January 1, 2019 through February 28, 2019. Roy’s Receive a $20 Bonus Card for every $100 you spend on Roy’s Gift Cards or Roys eGift Cards. Bonus Cards valid 01/01/19-02/12/19. Valid only at Roy’s Restaurants in the United States. Ruby Tuesday For every $50 in gift cards purchased between October 31 and December 31, 2018, you will receive one $15 Holiday bonus card FREE while supplies last. Offer available online (10/31 – 12/31/18) and in-store (while supplies last). Bonus cards valid January 2 – March 5, 2019. Single use promotional card; unused balance is forfeited. One per visit; dine-in and TueGo only at participating locations. Sephora When you redeem a Gift Card valued at $50 or more, you are eligible to receive a complimentary 45-minute Custom Makeover. Stage Buy more, Get More Offers! Buy $50 Stage eCard, get $5 eCard free. Buy $75 Stage eCard, get $10 eCard free. Buy $100 Stage eCard, get $15 eCard free. Offer valid for Stage eGift Cards purchased November 26 to December 2, 2018. Limit 5 Bonus Electronic Gift Cards per Transaction. Qualifying electronic gift cards must be purchased in $50, $75, or $100 denominations ONLY. Starr Restaurants When you purchase $500 in Starr Restaurants gift cards, receive a $50 bonus gift card. For every additional $250 spent, receive another $50 gift card. Gift Cards and Promotional Gift Cards do not expire and have no restrictions or blackout dates. Promotion is valid 12AM EST Wednesday November 14, 2018 until 11:59PM EST Monday January 7, 2019. Steak ‘n Shake Receive a Free $5 Bonus Certificate for every $20 in Gift Cards purchased. Certificate expires 2/28/19 and is valid at participating locations. Studio Movie Grill For every $25 worth of Studio Movie Grill Gift Cards purchased online at studiomoviegrill.com, the purchaser receives a free movie admission. The Free Movie Ticket is only valid for (1) one regular price admission. The Free Movie Ticket promotional value is valid from January 3rd – February 6th, 2019. The Promo offer ends January, 3rd 2019. Sullivan’s Steakhouse For every $100 spent in Sullivan’s Steakhouse gift cards, get $10 bonus card; every $500 gets you an extra $25 bonus card. Bonus card promotion is valid for gift card purchases November 1, 2018 – December 31, 2018. Bonus Cards valid for use January 1, 2019 to March 31, 2019 (excluding February 14, 2019). Redeemable at any Sullivan’s Steakhouse. Tony Roma’s For every $50 in Tony Roma eGift Cards you purchase, you will receive $15 in Roma Bucks. Offer valid 1/1/2019 – 3/22/2019. Eligible for redemption January 1, 2019 – March 22, 2019. If you find other gift card promotions, let me know about them in the comments below or at @GCGirlfriend on Twitter. Better yet, post them on Twitter using the #GiftCardDeals hashtag so we can all find out about these great gift card savings together. What are the EASIEST eGift Cards to Give During the Holidays? Find out which egift cards are the easiest to redeem without a smartphone or mobile wallet. Read More » about What are the EASIEST eGift Cards to Give During the Holidays?